Half chic lunch meeting spot, half New York eating joint. Half chic lunch meeting spot, half New York eating joint, Pickle and Pie have brought their best deli game to Lombard Street. The first eatery in the new Lombard precinct development, Pickle and Pie specialise in — well, we'll leave you to deduce that for yourselves. Just kidding, the pickles and pies are very good. On the day we visited, there was a delicious slow-cooked beef cheek pie in the cabinet. Paired with mashed potato and — what else — pickles, it made the perfect hearty lunch deal ($20). 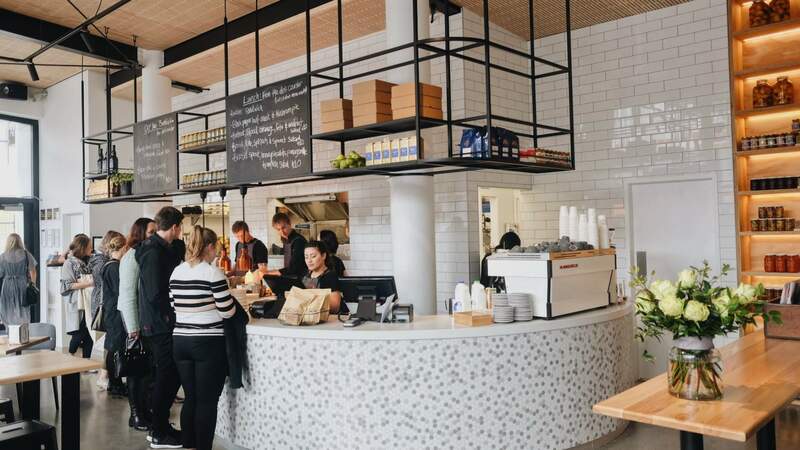 For anyone who's not so into meat, Pickle and Pie have taken cues from the traditional New Zealand deli and added freshly made salads, a great lunch choice on their own. The Moroccan carrot one ($10) was delicious, but there's an array of options for both vegetarians and carnivores (or omnivores, if balance is more your thing). Of course, what would a Jewish-American deli be without the classics — of course the pastrami sandwich is on the list, as are bagels and deli fries ($10). This latter option is definitely made to share, crinkle cut chips covered in gravy, melted cheese and shredded hot pastrami. Chef Tim Tracey has gone the extra mile with his offering, with housemade pickles and preserves available for you to take home. The spot also offers a "take home dinner" option, designed for pickup before the restaurant closes at seven if you're having a lazy moment. The perfect place for a chilled out lunch — or a glass of wine, should you be in the mood, Pickle and Pie is going to be awesome this summer. A big sunny glasshouse with plenty of space and light.